There seem to be a lot of questions about the watch we are featuring today on Speedy Tuesday. The Omega Speedmaster Professional Moonphase with Aventurine dial. Even on our favorite Omega Forum some people started to wonder whether it was a phantom Speedy or that it really exists. Well, we’ve definitely had it in our hands during our BaselWorld visit and in the meanwhile, we’ve seen a few photos floating around of this Speedy model for sale at a Californian Omega boutique. Although we like this ‘Speedy Aventurine’ a lot, there are a few things that keeps us busy. First of all, the wording ‘Professional’ on the dial seems a bit strange to us. Although it has definitely the same case shape as the Speedmaster Professional, this Speedy Aventurine measures 44.25mm in diameter. Of course, there are Speedmasters with a significant different case design that has been marked ‘Professional’ as well in the past. Also, there are Speedmasters that have a similar case design as the ‘Moonwatch’, have a larger diameter and are not marked as ‘Professional’. Pretty confusing, right? The reason for Omega to mark it as a ‘Professional’ might also be in the use of the hand wound movement. This Speedy Aventurine features Omega caliber 1866 – based on Lemania’s caliber 1884 – and is being used in the 42mm Omega Speedmaster Professional Moonphase as well. 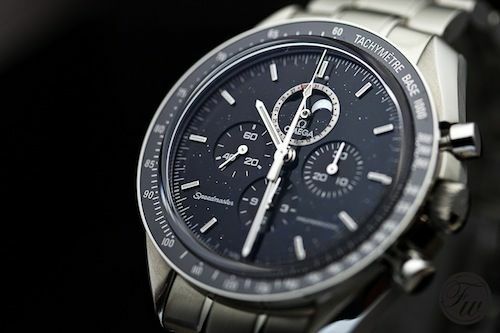 In the past, this movement also has been used in the Speedmaster Professional Moonphase Broad Arrow models (click here and here). 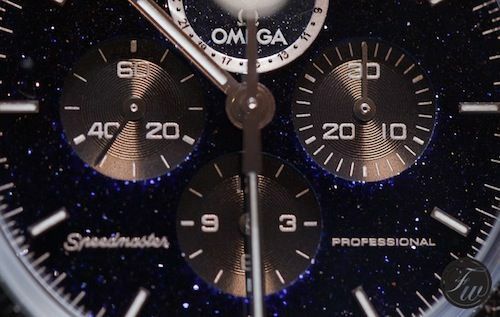 Anyway, it seems that Omega started to deliver the Speedy Aventurine to boutiques already which hopefully means that also the ‘regular’ retailer network will start to receive them. The list price of this watch has been set to 8600 Euro (which might be the price before the announced price increase per the 1st of October). One of the key features in this watch is definitely its dial, which consists of this Aventurine material. Aventurine, family of quartz, is a mineral that has some inclusions that cause the blue-ish shine and glitter. The dial on this watch is remarkable and together with the moon disc, it is like a nice starry sky. This Aventurine stone is quite rare and only to be found in few places in the world. 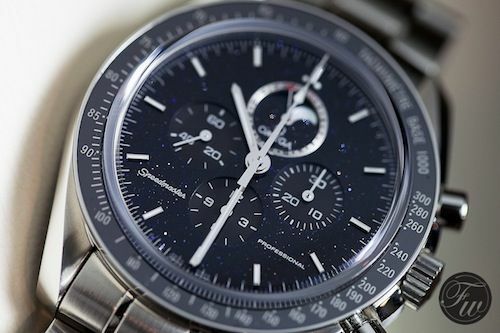 We assume that the price of this watch, which is quite a bit higher (for a Speedmaster Pro) than that we are used from our friends from Biel, is heavily influenced by the Aventurine dial. Nevertheless, we like this watch! We are looking for owners of a Speedmaster with a mission patch on the 9 o’clock sub register. 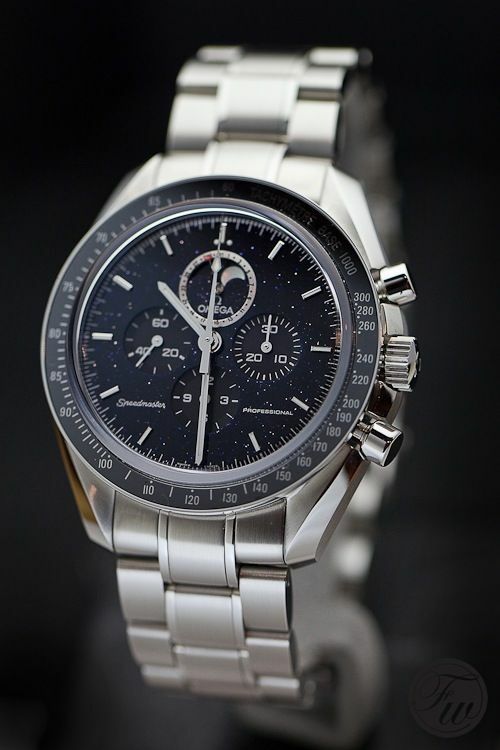 If you have one, and want to see it featured on Fratellowatches, please send an e-mail to speedmaster@www.fratellowatches.com. Click here for all previous Speedy Tuesday topics (or click at Speedy Tuesday in the navigation bar above).